The MONICA project demonstrates its pilot Common operational picture – COP on the “Hamburg DOM”. The largest fun fair in Northern Germany is held in front of Hamburg’s Cathedral for 30 days three times a year, in spring, summer and winter. The Winterdom takes place from the 9th of November to the 9th of December 2018. On an area of 160.000 qm² several hundred rides, snack shops, bakeries, taverns, shows and weekly fireworks expect over 2 million visitors. This year the MONICA project set up a system to address crowd management. The system consists of mobile and fixed IoT-enabled devices deployed at the event area. IoT-enabled meaning that these have sensors and can wirelessly connect to the Internet and communicate and initiate actions. The information exchanges in the MONICA project is handled by a cloud-based platform with control systems that monitor the collected data and perform automated actions based on behaviour modelling. The platform also consists of components which analyse data and detect critical incidents, supporting operators in assessing situations and making decisions. CNet has developed the database for the Common Operational Picture and the visualisation tool to provide decision support to the event operators. 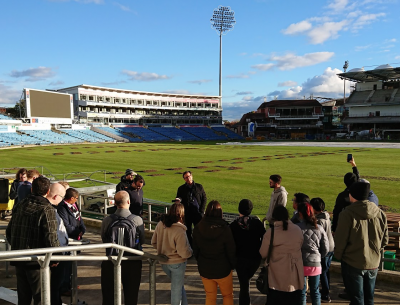 The second Hackathon of the MONICA project took place on 26th to 28th October 2018 in Leeds. Seven teams from Finland, Germany, Spain and the UK took part in the challenge for designing digital technologies that could help enhance sports fan engagement and experience at the stadium. The winner Pauline O’Callaghan impressed the jury with a solution for augmented hearing that enables stadium visitors to control their auditory environment during games. Pauline O’Callaghan, a young electronic engineer from Berlin, won €5000 prize money with her winning solution ‘Hearability’. The solution, an augmented hearing device for spectators with the mission of giving everyone control over their auditory environment, makes events safer and more inclusive to all. O’Callaghan presented several use cases including one that enables turning down the volume of a game when listening to what your friend is saying next to you and turning it up again when finished. The judges, including innovation and technical experts as well as stadium and project representatives, were impressed by the inclusivity aspect and the variety of possible use cases inside the stadium and elsewhere. As part of the prize, Pauline O’Callaghan will now receive six months of business support from MONICA to help her progress her winning prototype. Handling the crises faced by modern societies often requires the coordination of multiple types of stakeholders from different countries. One of the key requirements to manage crisis is to have access to situational awareness through ICT solutions. To act efficiently all involved stakeholders need to share a common operational picture. Together with a consortium of European emergency practioners, rescue operators, first responder organisations we are working in the Sayso project to define a new IoT based reference architecture for such system to be used in emergency situations involving many citizens.